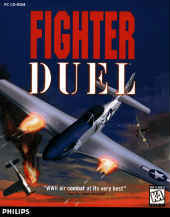 WW2 air combat simulator, port of the 1991 Amiga hit Fighter Duel. The game comes with 13 accurately modeled planes to fly in or against in 8 tactical scenarios to which you can make minimal adjustments with a "foe editor" which allows you to customize the enemy pilot's AI. Uses 640x480 256 polygonal gourad-shaded graphics and the game provides multiplayer support for head-to head action through modem, in standard or tournament mode and with support for DSVD (voice and data) modems. A Special Edition of the game was released in 1996 with additional features: improved flight models, 9-player IPX network play, radio chat, expanded video card compatibility, extra planes, improved joystick calibration and support, force feedback flightstick support, and keyboard controls.